Life is rough for my Jack Russell Terrier, especially when her ears won’t behave! What caption would you give this silly photo of Misha? This is a BlogPaws Bloghop Wordless Wednesday Bloghop post. Elaine, that was a funny caption! Thanks for stopping by! BOL!!! That is too funny! Hey, now you need to take a pic of your human’s bed head! GDS, thanks for stopping by! It is probably a good thing that Misha doesn’t know how to use a camera. LOL! This happens to Chuy all the time too! Aimee, Misha’s ears are so huge that it makes her head look out of balance. Thanks for comments! Paula, Can’t help but laugh at them when it happens, can we? Thanks for your comments! 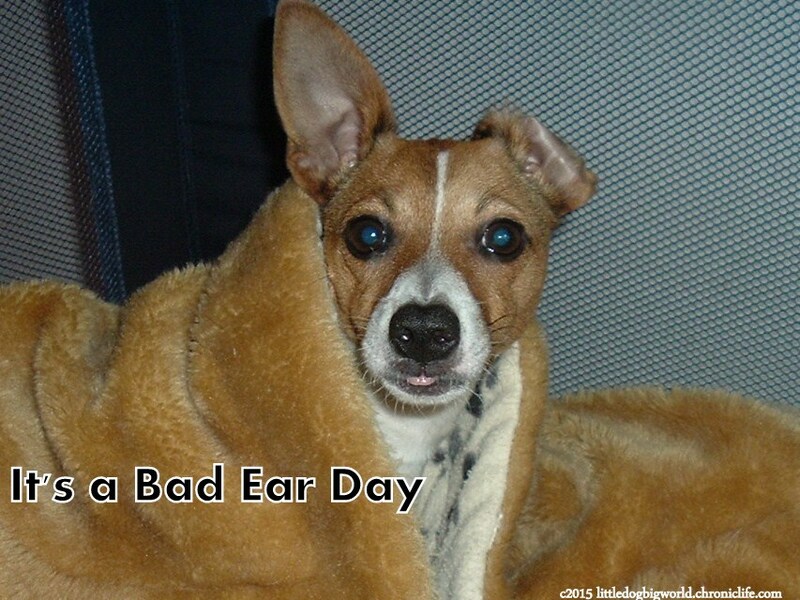 We have all had bad hair days, I mean bad ear days. No worries. Daily Pip, yes, we do. Luckily, they are over in 24 hours 🙂 Thanks for stopping by! I think it makes you look dashing. Misha is pleased with the compliment, Groovy GoldenDoodles!